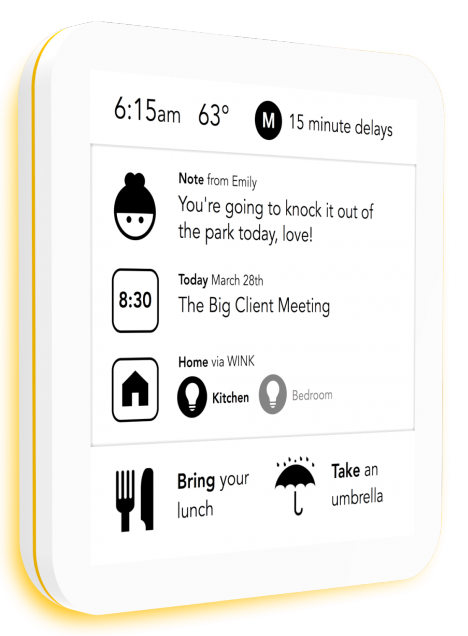 The SeeNote advertises itself as an "always on, digital sticky note." I don't necessarily want to be pinning it up in public where just anyone can see that next incoming message 1 or who my next appointment is with. But several main characters remain. And in order to determine the one true hero of them all […] we must turn to math. After a long day at work, finally at home, Crowley relaxes in his recliner in front of the tube. In the middle of his favorite movie (Harry Potter and the Forked Blockchain), a pizza commercial appears. "Darn!" he exclaims. "That was a healthy salad I had for dinner today, but I could really go for a pizza chaser." The reason this commercial suddenly interrupts Crowley's movie is not coincidental. Just at that moment, a pizza van driving by his house enters an automatic Bitcoin ad auction with Crowley's TV, earning the right to show its pizza commercial! All Crowley has to do is simply open his mouth: In response, the gesture-recognition system in Crowley's TV automatically sends 8 satoshis to the pizza van. In short order, the pizza van places a slice of pizza on a conveyor belt that extends from Crowley's house.